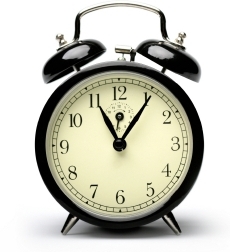 Why Do We Need an Alarm Clock? If you really think about it, waking nearly every morning to an alarm clock, with it's loud, rather unpleasant, and even bone jarring sound is rather uncivilized. Yet owning an one is the price we pay for living in a supposedly civilized world where time is of the essence, when packages absolutely, positively need to be there overnight, and we must punch the time clock precisely at the right moment to begin working for the day. These clocks are a necessity for us to start each day off right. While many people have substituted a clock radio for the noisy bell of the traditional alarm clock, the principle is the same. Americans have always shown a good work ethic with the motto “Early to bed and early to rise” so clocks with alarms have been a necessity throughout our history. Clock making in America has its roots in the Colonial Era when the first clocks were made with wooden works because the colonies lacked the technology to manufacture brass works and the money to import them. There are early examples from the 1820’s of alarms with wooden works. 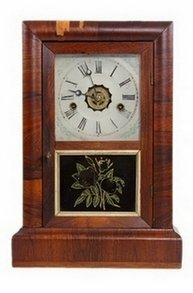 By the 1840’s American clockmakers introduced brass clock works which were fitted inside clocks with wooden cases known as shelf or mantel clocks. It wasn’t long before the major clock companies of the day, like Seth Thomas, Ansonia, and Waterbury to name just a few, were adding an alarm mechanism to the traditional shelf clock to make an alarm clock. While the ordinary shelf clock had a spring that needed to be wound for keeping time and another for chiming the hour, the shelf alarm provided a third spring for sounding the alarm bell. Typically the winding shaft for the alarm portion of the clock was smaller than the other two shafts so these clocks came with a 2-sided key. The time for the alarm bell to ring was set by rotating a dial with the hours of the day that was on the front of the clock (notice the setting ring in the center of the dial of the clock below). 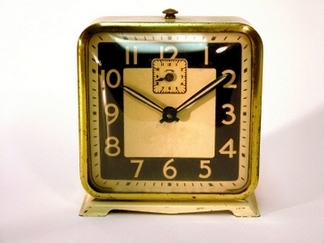 These shelf-type clocks were popular from about the 1860’s until the turn of the century. It’s hard to know how effective these early clocks were in arousing people from sleep because the shelf clock was typically kept in the kitchen or in the living room of fancier homes, some distance from where the occupants slept. In 1876, the Seth Thomas Clock Company received a patent for the first bedside alarm which was significantly smaller than a shelf clock. The earliest bedside alarms are recognized by the bell mechanism prominently placed on the top of the clock case. The most famous American bedside alarms were made under the brand name of Westclox from 1909 until the present day with just a few gaps. The Big Ben “tin can” clock featured a “bell back” design where the entire metal clock resonated as the alarm. Only the unconscious can sleep through the sound of a Big Ben. Many people purchased the more demure Westclox version known as Baby Ben, which was smaller and quieter. While case designs of both Big Ben and Baby Ben clocks varied slightly over the decades, they have become the standard for American alarm clocks. There has been a resurgence in interest in these original clocks; reproduction versions continue to sell well even with other competing forms of alarms. If you are looking for that perfect alarm clock, there is no place better than Ebay. They have thousands to choose from. You can buy anything from antiques to brand new at the price you're willing to pay. See what's available today.